Design International, an award-winning studio based in Dubai, UAE, has announced the opening of a new retail destination - The Aura Valle Aurelia - in the heart of Rome, not far from the Vatican City. The architectural project, commissioned by CDS Holding and Orion, is led the award-winning Design International studio, directed by Davide Padoa, assisted by Stefano Cordeschi for the building permit. 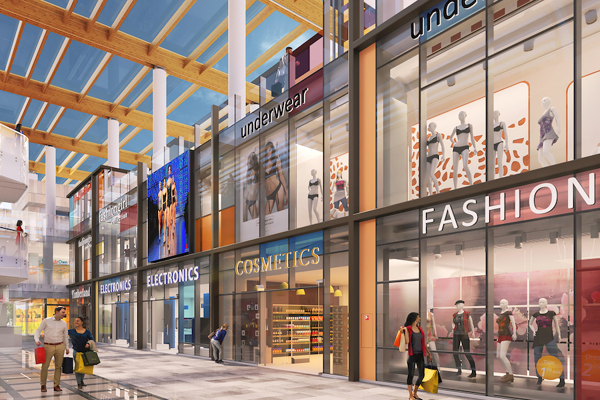 Aura Mall is part of a larger urban redevelopment project for the entire Valle Aurelia district, the aim of which is to reorganize services and enhance the former Fornace Veschi area. Adjacent to the new Piazza de Fornace, the shopping centre is designed to be a focal point, providing a welcoming environment for people to meet and spend time, with easy access from the surrounding residential areas and the nearby underground and railway stations, said a statement from the company. With 60 shops, a hypermarket, a gym and a book store alongside the carefully designed spaces for recreational activities, the abundant green spaces and the many different dining possibilities, Aura Mall will provide a wide choice of opportunities for local residents and visitors alike, it stated. The design of the mall actively follows the natural contours/slope of the site, using the height differentials to create access points on different levels while, simultaneously also framing interesting views of the surrounding town on each side. At the heart of the project is a commercial gallery which culminates in a secluded square for public use. Partly open-air, the gallery also acts as a link between the subway station, the residential area and Piazza della Fornace. The top floor comprises a key design feature of the mall – the terrace food-court. From here, visitors can enjoy a panoramic view of Rome while relishing the wealth of cuisines on offer. Beneath the mall, there are two underground garages that can accommodate over 700 cars, said the Dubai-based design firm. Another defining design feature is the “permeability” of the Aura Mall, with continuous flow between internal and external spaces, verdant flows of nature throughout and the innate connectivity embodied in the connecting ramps at all levels which, like the High Line of New York, creates a series of linear parks, with continuous views towards the Piazza della Fornace and the constantly varying views of the Aura Mall building. Design International said this deliberate design feature of permeability is underlined by the choice of the cover to the terrace-food court: entirely made of laminated wood and glass, this architectural element favors natural light, which illuminates the gallery beneath. All the levels that overlook it enjoy natural light, and the sky is thus transformed into a scenic element that is enlivened by the continuous interplay play of reflections, accentuated by the glass, it stated. The design of the interior sensitively reflects the urban nature of the center by creating the gallery as central street, conceived as space to be both directional as well as place to stop, linger and admire the surroundings, it added.